Youth Focus is excited to announce that the 2019 Night of Nights will be held on Saturday 31 August. Interested in supporting the Night of Nights? Download the 2019 Partnership Proposal here. Highlights of the event included an inspirational performance by the Western Australian Academy of Performing Arts Gospel Choir, the talented James Wilson who sang Aussie classics while playing the didgeridoo, drums and guitar, plus the powerhouse voice of Chrislyn Hamilton. Guests then danced the night away on WA’s first ever round dancefloor, to the high energy dance floor hits of Proof The Band! Another highlight was the ever-popular Silent and Live Auctions, which showcased some of Western Australia’s most sensational items and experiences. The Grand Ballroom fell silent for the pledge moment as guests were moved by the story of a former client. In this special moment, guests were asked to make a life-changing commitment to support a young person on their journey to recovery. This year, the pledge moment alone raised a record-breaking amount to support Youth Focus. Thank you to the generous supporters of the event, in particular, Platinum Event Sponsor and long-time partner, Audi Centre Perth. Audi Centre Perth has supported the Youth Focus ball for many years. 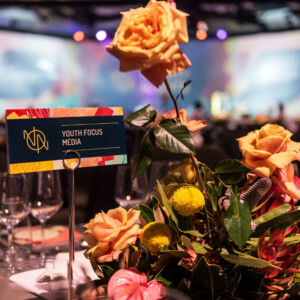 Without the support of sponsors like Audi Centre Perth, Youth Focus would not be able to deliver this iconic event to help address the stigma surrounding mental health and suicide, as well as raise vital funds for Western Australian youth. Click here to view the full album of photos from the event on our Facebook page or click on the gallery to the right for the highlights.